The Dante Quartet was formed in 1995 and has become one of the country's most popular and versatile chamber music groups. Winning the Royal Philharmonic Society's Award for Chamber Music in 2005, they now have a reputation which makes them in demand worldwide. ​Octagon Music Society’s 38th season was given the best possible launch on Sunday afternoon with a visit from the Dante Quartet. That name has been a guarantee of fine music making on the British music scene for over twenty years and, although the personnel have changed from time to time, they have been a consistent presence at the top of the chamber music leader’s board. Their leader, Krysia Osostowicz, was a founder member, and now with violinist Oscar Perks, violist Yuko Inoue and cellist Richard Jenkinson, they have been a unit for over four years. They play with a clear sense of unity, and a directness and character which pervades all they do. The first half consisted of two works which both are outside the standard repertoire at present. Shostakovich’s First quartet was an appropriate starting point for the OMS season, being the composer’s first work (of an eventual 15) for this medium and in the key of C major. But this was no juvenile effort; he was already 31, and had written five symphonies, most recently the monumental Fifth. Yet this brief work, four movements playing over less than twenty minutes, bears none of the musical fingerprints of the mature composer. These are miniatures, and seem closer to the composer’s stage and film music than to his symphonic output. For the Dante, this marked the beginning of an epic journey; they are studying all Shostakovich’s quartets in the coming year, and will perform them next October over a single weekend for Bromsgrove Music Society. Schumann was much the same age as Shostakovich when he wrote his three quartets. We heard the second in F major, the least heard of them. Schumann’s works are often identified by where they came in relation to his happy marriage to Clara. This quartet came after their marriage in 1839 and after the ‘Year of Song’ when Schumann gave voice to his marital happiness. Perhaps he was now devoting himself to his other great love, music? Conventional in its writing and with long romantic melodies, it made few demands on the listener, whilst making a contrast with the Shostakovich we had just heard. ‘Conventional’, though, is a word that could never be used of Beethoven’s Third Rasumovsky Quartet Op. 59/3. 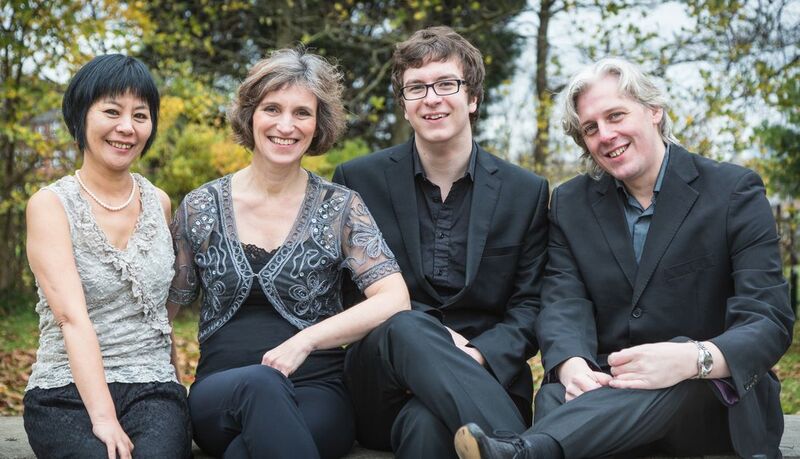 The Dante had last year immersed themselves in the music of Beethoven, culminating in a complete cycle of all his quartets at Bromsgrove (they seem to have a taste for these marathons!). What we heard was the result of total commitment and understanding from four musicians in complete unanimity and control. The performance of the allegro molto last movement led one audience member to leap to his feet in excitement, exclaiming ‘that was real rock and roll!’ Indeed it was a performance which had the same energy and mounting excitement which speaks to a listener so directly. As always at The Muse, there was a fifth participant in the music making – the superb acoustic of the hall. The highest notes of the violin had a sparkle and freshness which few halls can give: the sound of the cello had a bloom and resonance on which the other instruments can ‘sit’, whilst the inner parts come over with all detail and shading audible. How lucky we in Watford are to have the Muse as our home. And have you noticed that OMS audiences are cough-free? At Wigmore Hall, they preface concerts with a recorded message to ‘stifle your coughing’. No need for this at OMS….is it because the performers can see us all, and can identify any unfortunate cougher? Unlike some of the other top quartets, the members of the Dante manage to combine their work with many other music undertakings. Krysia Ostostowicz, for example, was on Saturday recording in a new concert hall in Wells with pianist Daniel Tong. And after our concert she went off to give a lesson to a pupil who lived in North London. Richard Jenkinson joined the Dante after eighteen years playing in the City of Birmingham Symphony Orchestra – he was the last new orchestral member to be auditioned by Simon Rattle. He left to join the quartet and also to write his Ph.D. thesis at Birmingham University on the music of Kodaly and Czech Nationalism. And in his spare time he conducts three orchestras. Perhaps it is this all round immersion in the many worlds of music that makes such balanced and complete musicians?